2017 was another busy and productive year for the OTW’s Finance team! We’ve continued to improve the efficiency of the organization’s financial policies and adherence to standard accounting practices. We started our first ever audit of financial statements, which concluded in early 2018. You can check out our audited financial statements for 2015 and 2016 on the OTW Finance page. We’re now preparing for the audit of our 2017 financial statements, which should start within a few weeks. US$13,334.02 spent so far out of US$266,032.07 total this year, as of February 28, 2018. 75.1% of the OTW’s expenses go towards maintaining the AO3. This includes the bulk of our server expenses—both new purchases and ongoing colocation and maintenance—website performance monitoring tools and various systems-related licences (access all program expenses). This year’s projected AO3 expenses include US$100,000 in contractor costs. We’re quite pleased with our contractor’s work on the Archive’s Rails and Elasticsearch upgrades and look forward to continuing to work with them on other projects. In addition to contracting costs, AO3 expenses include a significant server overhaul to the tune of around US$96,000 in total. This overhaul focuses on new database servers for AO3 works, comments, and other activities, as well as a new server rack for them to live on. The new servers should also increase our colocation expenses, while the old machines will be repurposed as application servers, which generate the Archive’s pages and serve them to users. US$257.44 spent so far out of US$4,897.97 total this year, as of February 28, 2018. US$418.81 spent so far out of US$2,993.99 total this year, as of February 28, 2018. Transformative Works and Cultures ’ expenses are its allotment of server costs, as well as the journal’s publishing and storage fees (access all program expenses). US$94.16 spent so far out of US$1,257.11 total this year, as of February 28, 2018. US$1,500.00 spent so far out of US$5,000.00 total this year, as of February 28, 2018. Legal’s expenses consist of filing fees and travel expenses for conferences and hearings. US$1,500 was spent in January to file a WIPO Dispute fee because someone else registered a domain address too similar to AO3’s. (access all program expenses). US$1,751.46 spent so far out of US$26,135.00 total this year, as of February 28, 2018. Our fundraising expenses consist of transaction fees charged by our third-party payment processors for each donation; thank-you gift purchases and shipping; and the tools used to host the OTW’s membership database and track communications with donors and potential donors (access fundraising expenses). US$2,023.59 spent so far out of US$47,823.40 total this year, as of February 28, 2018. The OTW’s administrative expenses include hosting for our website, trademarks, domains, insurance, tax filing, and auditing, as well as communication and accounting tools (access all admin expenses). 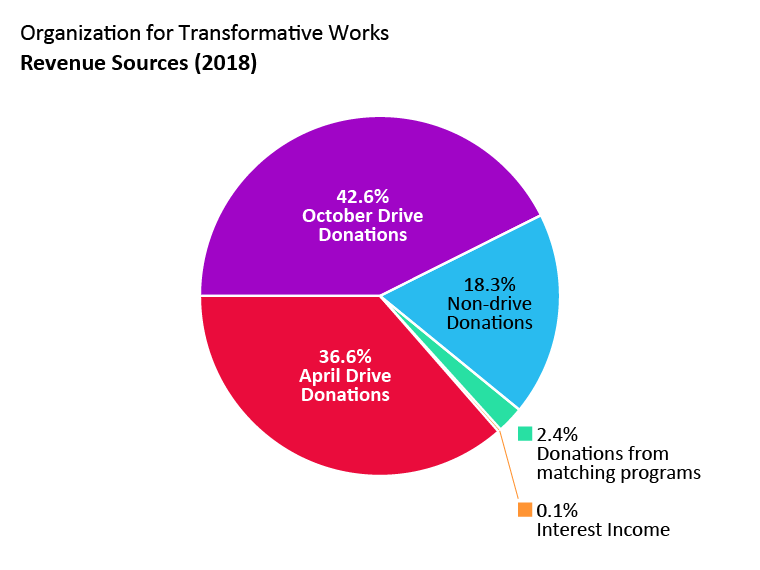 We receive most of our donations each year in the April and October fundraising drives, which together should account for about 79% of our income in 2018. We also receive donations via employer matching programs, Amazon Smile, and PayPal Giving Fund, which administers donations from programs like Humble Bundle. If you’d like to support us while making purchases on those websites, please select the Organization for Transformative Works as your charity of choice! Given your generosity in previous years, we have a healthy amount in reserves, which we plan to keep in store for a rainy day. Thanks to this, we can explore alternative revenue sources to supplement your donations. The Finance team and the OTW board have decided on a conservative investment portfolio for a small portion of our funds to start with, which will not place the initial investment in any risk. This move is long overdue, and we’re glad to have a solid policy regarding investment and usage of our reserves in place. The reserves also help bolster us in years when we’re planning larger than usual purchases. As mentioned previously, we have plans to replace old server hardware over the next few months, which significantly bolster our expenses for this year. Our current projected expenses for this year exceed estimated 2018 revenues by roughly US$30,000. The additional amount may be withdrawn from reserves on an as-needed basis during the year. US$12,668.54 received so far (as of February 28, 2018) and US$315,631.46 projected to be received until the end of the year. If you have any questions about the budget or the OTW’s finances, please contact the Finance committee. We will also be hosting an open chat to answer any questions you may have. This chat will take place in our public chatroom on April 21 from 8 to 10PM UTC (what time is that in my timezone?). 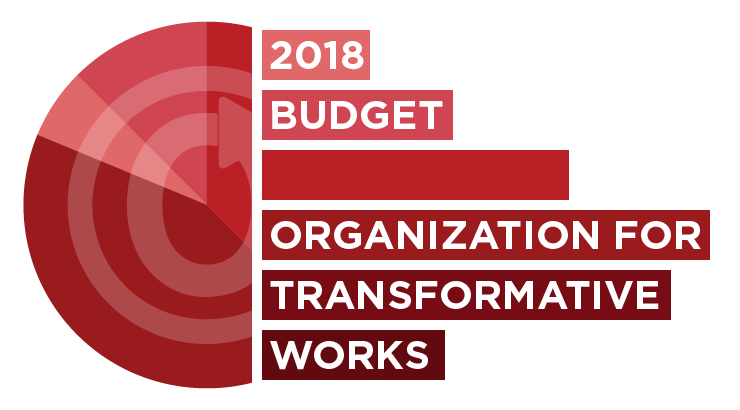 To download the OTW’s budget for 2018 in spreadsheet format, please follow this link.